Happy you made the grade! for an ace meal before or after the head spinning drinkies served here is... and we love it because a hearty Italian meal in lovely surroundings might be just the thing to soak up all that alcohol! Amarone has the style and class to match any visit to Blue Dog. And its only a short stroll away. ... so do you want to know what's keeping those 'in-the-know' folks talking about Blue Dog? It's... the late opening hours (3am every night!) 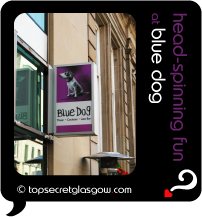 So you can drop into Blue Dog after a night out, for a nightcap and to chill out for a while before heading home. Enjoy! Now... don't tell anyone else. And DO NOT reveal this Blue Dog top secret file and password. We'll know.... And we'll track you down and sneak little sticky "muppet!" labels onto your back! And get yourself onto the VIP list below while it's still open, and I'll drop you a short email every time we reveal something new about Blue Dog. for an ace meal before or after the head spinning drinkies served here is... and we love it because any time in classy Blue Dog should include a classy meal, and Gamba serves up just that. Fresh fish dishes well prepared will keep you happy, and the rest of the menu is up to a very high standard. And remember you can grab your own page here to share your tips, photos and stories about Blue Dog. Have fun! Great news! Finding this page means you can now join our VIP list for Blue Dog. You found the Top Secret File for Blue Dog. If you don't have a password yet, there are still lots of great things about Blue Dog in its Buzz Page. ("The Buzz" page is also the place to pick-up the password by taking part). Blue Dog does not offer any booking services that we know. You can always contact them to check.